Who can remember dropping to the ground to do push-ups in high school gym class? Either you loved them or dreaded the drill. This old-school exercise is still considered a good method for assessing strength and optimal fitness. Even the U.S. Army and the Presidential Physical Fitness Challenge continue to use push-ups as a means of assessing strength and endurance. As we age, push-ups can also be a good snapshot of a person’s current fitness level. The amount you can do at one time can be an accurate measure of strength and overall fitness. Push-ups help build muscle improving many of the vital biomechanics of aging. For example, the motion mimics your natural reaction when you fall, where you extend your arms, hands, and wrists to absorb the impact. Performing push-ups teaches our body better muscle memory by keeping the upper body strong in order to react quickly protecting yourself in case of a fall. Push-ups have long been considered to be the perfect exercise. There is no other exercise that will work every major muscle group in the entire body quite like a push-up does – however doing pull-ups comes close. Push-ups are considered a compound movement meaning it’s a multi-joint movement working several muscles or muscle groups at one time. Performing a push-up engages and works the chest, shoulders, triceps, back, and abdomen while increasing upper body strength. 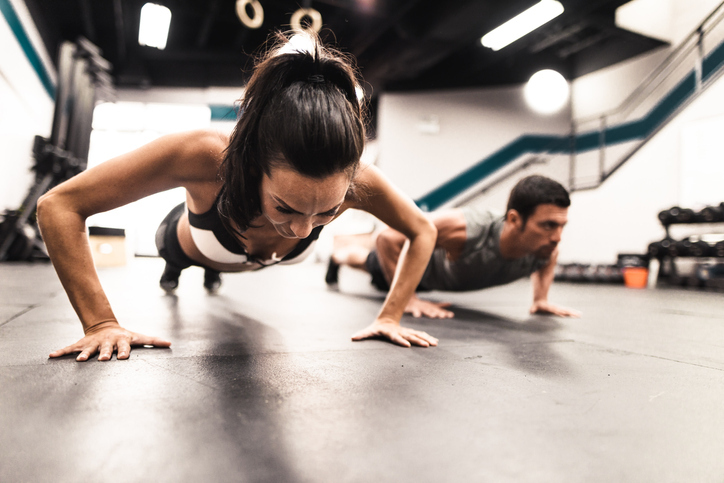 There are numerous reasons why push-ups are so effective for building and enhancing fitness and strength in both men and women. Maybe it’s been years since you’ve attempted a push-up. If so, find your starting point of how many you can do while keeping good form. No matter whether you can do 10, 5, or 2, you have to start somewhere and build from there. Whatever number you can do comfortably starting out, use this number and try to increase the number by one or two every week – you can start out with a modified push-up or full body push-up. As strength improves, you can continue to add more reps or move up to a full push-up position if you’re using a modified one. If you find it hard to find time to squeeze in push-ups, remember to do them before brushing your teeth or showering. · Push-ups are free – no equipment except for yourself. · They can be done almost anywhere – all you need is just a few square feet and your private gym is open. · You don’t have to do them necessarily in gym clothes. You can drop to the floor in almost any clothing you’re wearing and perform push-ups as is. · There is little to no risk of an injury when doing push-ups and they can help decrease the risk of injury during sports. · Besides working several major muscle groups, push-ups are also working your cardiovascular system. Your heart rate increase, you are breathing deeper, and your lungs are becoming stronger. Push-ups involve both a cardo-endurance and cardio interval training wrapped up into one exercise. · To build and sculpt your muscles from your shoulders to your toes, push-ups are your answer. You’ll be amazed at how they can turn your physique into a lithe, sculptured, well-proportioned frame. Plus push-ups allow you to get a full body workout faster. · Push-ups push your body to build muscle turning you into a fat-burning machine. The more muscle you have, the more calories your body burns – one pound of muscle burns 35 calories a day compared to just 2 calories burned one pound of fat per day. · Performing push-ups will allow you to lift heavier loads and build more strength. Performing a push-up correctly is important making sure your form is how it should be. If you are just starting out, build up gradually until you are doing them daily.